Ok, so maybe you are over the whole sunburst mirror fad, but I happen to still love them. I thought I would put my own spin on the sunburst mirror and the bookpage wreaths, that I'm sure you've all seen, by combining the two. I'm going to do my best to explain what I did, but as they say a picture is worth a thousand words so I tried to document with pictures as I went. The yellowed pages of older books seem to work better but you can use pretty much any book that you want. For this particular project I chose to use old church hymnals that my mom found for me. Just rip the pages out of the book and roll them, making sure not to flatten them. 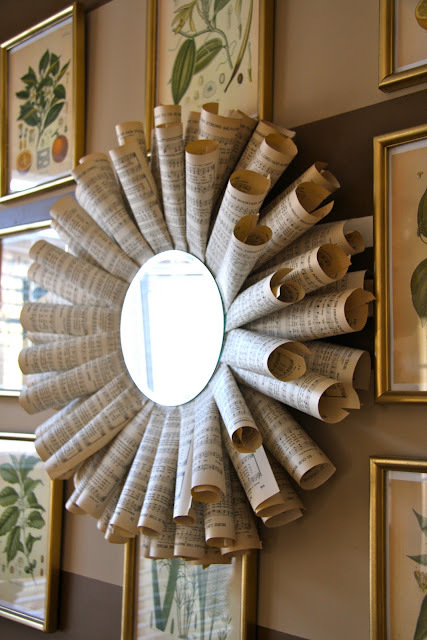 Before you get started attaching your pages, trace around the foam wreath on a piece of cardboard so you can finish the back of the mirror when you are done. Next you need to attach some ribbon so you can hang it. It's going to be pretty light, but I used pins and hot glue just to make sure it stays in place. Then, I finished the back edge by attaching the cardboard I had traced out earlier. You could choose to get a little fancy with this but it will never be seen so it doesn't really matter. 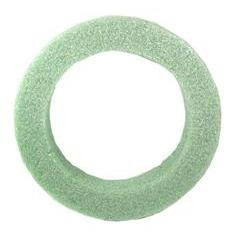 Now you are ready to attach the mirror. 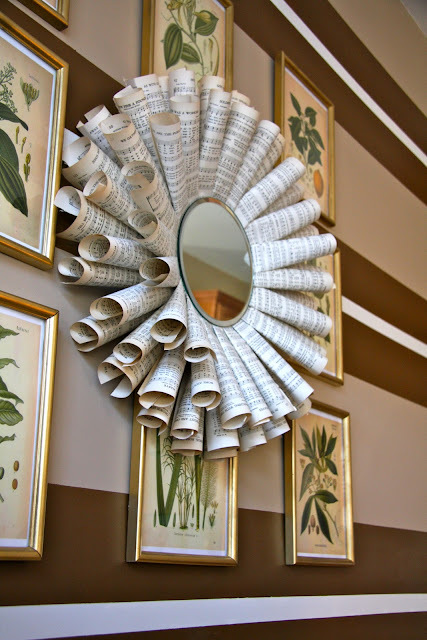 Flip it over and apply LOTS of hot glue to the edges of the mirror and glue it in place. 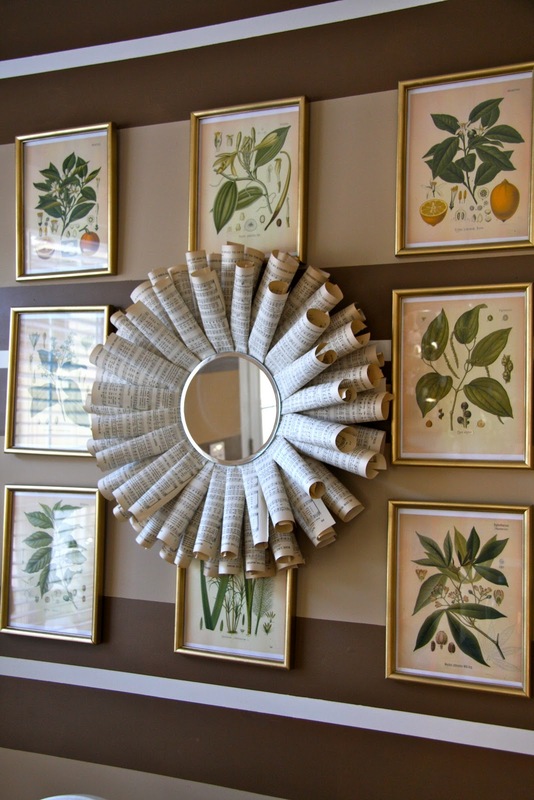 I used a round craft mirror from Hobby Lobby. I chose one with a beveled edge because I thought it looked more professional. and now you have the finished product! Something a little unusual and unexpected, maybe even a conversation piece. I don't have room for it in our house so it's making it's way to our booth to find a new home. 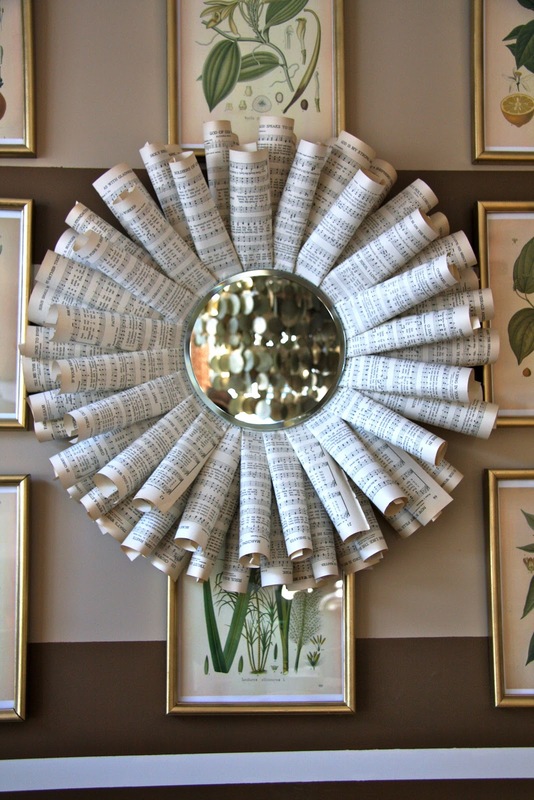 i love this sunburst mirror! Such a neat idea, turned out really lovely. Love it! That is gorgeous I have a similar plan for book pages and mirror. You rocked this! Oh my word...love it! are you selling it at the booth?? by the way...I will send you pics, Livi LOVES her kitchen! Thanks everyone! Bonnie, yes I am selling it at the booth...I'm so glad to hear that Alivia likes her kitchen! Can I buy this mirror from you!? I'm serious! My husband is our worship pastor and this would be amazing in our home near the piano!